Today my son is home sick from school. After taking care of him in the morning and preparing our lunch, my husband took over for the afternoon. I turned toward my desk and began my afternoon of reading and writing. I didn't object when he suggested a movie to our son, but a few hours later when I went in to check on them I found them parked in our bed watching various games on hubby's iPhone and computer alternatively. Considering it was 15-minutes before our son's dinnertime, I suggested he had had enough screen-time (morning cartoons, afternoon movie and now this) and perhaps it might be good to go look at some books or play a bit. A few minutes later I hear some clanging and other "suspect" sounds in the kitchen. Thinking my husband left our son in his room and was actually preparing his dinner on time, I peeked inside to observe. 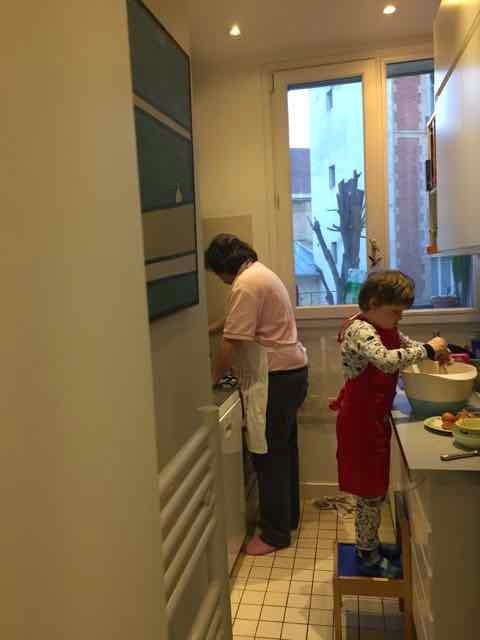 I open the door only to find a father-son duo preparing a chocolate cake! I just have to laugh because sometimes the different approach to life by each gender is so obvious, so typical, so funny. And of course, so sweet!